Publisher: Crash Wave Games Inc. Developer: Crash Wave Games Inc. 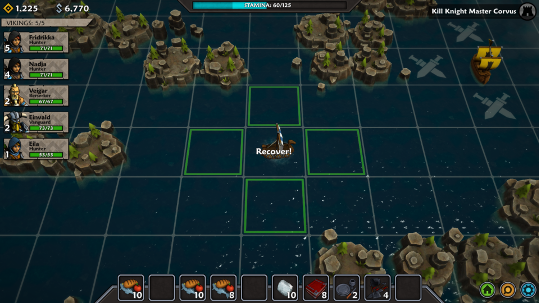 I like Iron Tides, it’s one of them rogue-like tactical RPG thingumies that’s in Early Access. It’s also got Vikings and Pirates which are both things that I like. It doesn’t try hard to look serious, and it’s all the better for it. I’ve played through some of the main missions, as well as a few of the side missions and it’s as deceptively difficult as it is tactical. The early missions are tutorialised (totally a word) to some degree but that didn’t save me from my own foolish mistakes, regardless of how well equipped (I thought) I was. Food is sort of the movement currency of your viking band, and I was surprised how easily I was running low on supplies. You can still move after your supplies have run dry, but a viking will be damaged each turn you move. They do all get healed to full when you decide to feed them, so you can work it in a way that consumes less food but runs the risk of maybe killing one off if you’re not careful. The second thing that caught me out is that there are enemies that will brain one of your vikings if you’re not careful. So, running high on a few easy missions and some deftly-won battles, I decided that the fortress I was specifically told to avoid because it would be “too hard” – or something along those lines – was worth taking on. I do regret that decision. A baddie far more powerful than any other I’d even seen so far was lurking there with some other fairly high-powered individuals, all of which shot me with guns, which I hadn’t accounted for. Through a mixture of luck, a good critical hit, and making one of my Vikings into a sacrificial lamb I managed to come out the other side scathed but mostly alive. Losing my berserker wasn’t giving me the same feeling as losing someone in Fire Emblem or XCOM, but in fairness I did happen upon a spare berserker that was a level higher with skills I preferred only a few turns before. 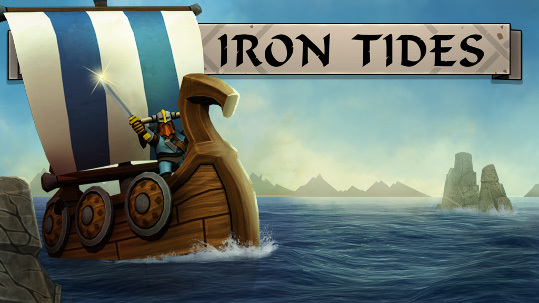 The thing that I like the most about Iron Tides is a feature that you don’t see much of outside of JRPGs. Chaining kills in one turn increases the amount of XP you earn. 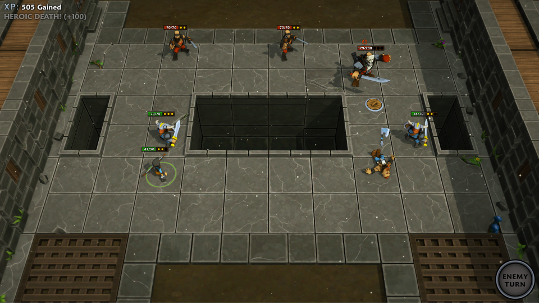 Leaving enemies low so you can wipe them all out at once for huge XP bonuses is viable; and a little reckless. What makes it work so well though, is the Fury mechanic. Fury is about as close as the game gets to simulating blood-fueled rampages. 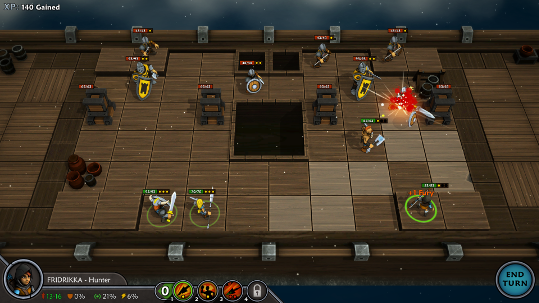 Each Viking only has three non-movement actions per turn but you regain one action for every kill you get. You can’t regain movement so it’s not an overly powerful system, but it does mean you can cut a few pirates to pieces in a short period of time. And, most importantly, it feels great. Being able to take an archer in to lower the health of a pirate just enough so that I can start a mini rampage with my berserker or vanguard is a pretty wonderful feeling. Especially if I can get a lucky crit in there too for an instant kill. The only thing I enjoy more than that is having my valkyrie leap behind enemy lines to kill off key targets like the obnoxious bomb-throwing pirates. It’s got a nice tutorial which eases you in – should you heed their advice – which is usually the last thing that appears in Early Access, so having it front loaded is not only appreciated but it has made it far easier to get to grips with everything. I’m enjoying it, but I’m cautious, as roguelikes tend to be quite punishing at times and I’m waiting to see how this unfolds. It’s pretty good as it stands, but there are lots more missions to be added in future updates; so we’ll see how I feel about it once they add more to the campaign.